It was announced in April 2014 that Stephen Colbert will replace David Letterman as the host of CBS's Late Show when Letterman retires in 2015. Comedy Central's star faux reporter (The Colbert Report) launched on the scene big time in 2006 with his brilliant and scathing performance at the White House Correspondents' dinner, and the Colbert-coined "truthiness" was chosen as Word of the Year by the American Dialetic Society and Meriam-Webster. 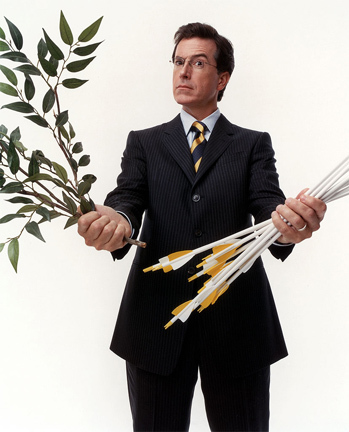 In a January 2006 City Arts and Lectures interview with San Francisco Chronicle TV critic Tim Goodman at the Herbst theatre in San Francisco, Colbert said he smoked "a lot" of pot for a period of time in high school, while honing his devil-may-care comedy style. Hear the audio. (Letterman, BTW, has also said he smoked "really a breathtaking amount of grass almost every night" at one time in his life and still uses it sporatically). On his 2007 debut, during a (mock) interview with Ethan Nadelmann of the Drug Policy Alliance, Colbert demonstrated he knew what "shake" is. Nadelmann commented that while viewers surely must get drunk to watch Bill O'Reilly, probably half of Colbert's audience got stoned before watching. On his January 18 show while introducing O'Reilly, Colbert announced, "You're not high, Bill O'Reilly is really here. You might also be high." On July 26, he showed a clip of the USDA's 1942 film Hemp for Victory film before introducing Marijuana Policy Project's Aaron Houston. He asked Ben & Jerry about their flavor named for VIP Willie Nelson, "What's his made of, shredded tax forms and hash?" During a 2008 interview with Carole King, he pulled out his Tapestry album and noted it was a double, briefly demonstrating how this allowed people to clean their pot on it in the 70s. On his first show of 2014, after Colorado started selling legal pot, he took on columnists Ruth Marcus and Davis Brooks with the line: "I applaud Marcus and Brooks for taking a stand against legalizing the pot they smoked." He took Tokin Woman's Top Tweet of the Year award in 2013 with, "I'm no fan of drug addicts, just thinking about them makes me so angry I need another Xanax." Colbert interviewed psychedelic author Daniel Pinchbeck in a segment that began with some pretty trippy camerawork. After Pinchbeck's description of a Yage trip, Colbert commented it was like the opposite of a hangover--you feel sick first and good the next day. With Colbert, we always feel good.